Aerial view of the new Royal Adelaide Hospital site at the west end of North Terrace as of June 7, 2012 courtesy of radio 891. Prior to the start of building, medical staff opposed a shift in location. They argued for re-development of the existing complex, pointing out that the present position was ideal in many ways. 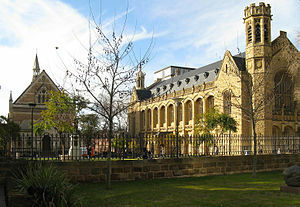 It shares the site with the Institute of Medical and Veterinary Science pathology facility; adjacent are the Dental and Medical Schools; whilst the other side of quiet and leafy Frome Road lies the campus of the University of Adelaide. The Eastern Wing of the hospital overlooks the lovely Adelaide Botanic gardens to the east, and there are parklands to the north. North Terrace along the southern boundary provides easy patient and visitor access via existing public transport. Further west along tree-lined North Terrrace are the elegant buildings of Elder Hall, the Museum and the Art Gallery. 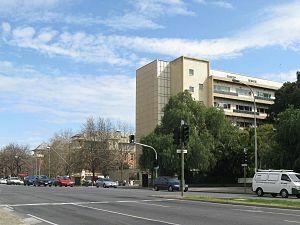 Just across North Terrace there is ample public parking, the shops, restaurants and cinemas of Rundle Street East, and attractive apartments. The Royal Adelaide Hospital has provided excellence in medical care since 1840 at its present location. The tradition remains but the new site is one mile away at the other end of a congested North Terrace along which traffic moves at a tortuously slow speed. Many will deplore the move from the elegant eastern end of the terrace to the noisy and brash West End, home of the Adelaide Casino, and the bars and night clubs of Hindley Street. ‹ Please don’t spoil our beautiful city! Are you better off investing your surplus funds into your residence than into Superannuation? Government’s compassionate inclusion of melanoma drug Keytruda on the PBS. Hi Ken, Those repayment figures and other facts were made public by the Save RAH group before the 2010 election. The $12bn figure was not questioned by the inexperienced, inept and, at times, sycophantic media. which perpetrated that wasteful senseless change. The fiscal disaster is grave enough but what about the irreversible damage to our Educational and Research institutions? My prediction is that the quality of health services will diminish and current problems in Public Hospitals will not be addressed. Sadly, our reputation as a leading Medical Research Hub will be lost. Thanks Jim for your comment. Sooner or later it will become apparent how costly the relocation will be for tax-payers; all too late to avoid. The chosen location is a far from smart planning decision I fear. A grand vision, spoiled by a lack of consultation. One must conclude that the author of this article is from the eastern suburbs. No mention of the massive redevelopment already taking place in the west end, or the $200 million South Australian Health and Medical Research Institute already being built right next door to the new site. Nor the fact that the University of SA is across the street, or that the new Adelaide uni medical school was intending to move with the hospital in any event. – Traffic congestion. It straddles probably Adelaide’s busiest intersection between North and West Terraces, and the start of Port Road, when Emergency vehicles need urgent access. – Despite the proximity of the campus of the University of SA, this part of the city is at present the entertainment hub. I worry for the safety of staff, and hospital visitors if the planned car-park is inadequate to accommodate all who will need access. – The site may not be large enough to accommodate all specialist services, and departments. Once complete no doubt the negatives will be soon forgotten, and the tradition of the 180-year old former Royal Adelaide Hospital will continue. Inflation should ease the burden of the repayments for tax-payers.